It is shocking to me just how many people suffer from migraine headaches. Even more surprising is just how many people present to an ENT clinic with complaints of a persistent sinus infection when really the sinus pain is actually due to a migraine. 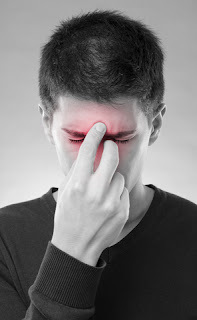 In fact, there are some estimates that up to 80% of patients who present to an ENT clinic with primary complaint of sinus headaches or chronic sinusitis ultimately are proven to be suffering from migraines instead. See references below. This reported estimate is a bit high in my experience which runs more around 50%. I have a severe sinus infection that has been going on for months... in fact it is so bad that even though I have taken 3 different antibiotics, it has made no difference in my severe pain and pressure I have over my sinuses. It is also not unusual for a patient to also complain of systemic symptoms that sound like the flu (muscle and joint aches, malaise, fatigue, chills, loss of appetite, etc). Given the prevalence of migraines in an ENT clinic, it is not unusual for me to at least initiate migraine treatment along with a referral to a neurologist who are the migraine experts. To try and prevent migraines from happening in the first place, I recommend patients to start the following over-the-counter supplements which often help decrease frequency and severity of migraines. Of course, one has to take for a few months before appreciating any potential benefit. Depending on any coexisting medical problems, I may even start a patient on prescription sumatriptan to try and treat any migraines that do occur to see if it helps. The Sinus, Allergy and Migraine Study (SAMS). Headache 2007 Feb; 47 (2) : 213-24. Prevalence of migraine in patients with a history of self-reported or physician-diagnosed "sinus" headache. Archives of Internal Medicine 2004 Sep 13; 164 (16) : 1769-72. Evidence-based guideline update: pharmacologic treatment for episodic migraine prevention in adults: report of the Quality Standards Subcommittee of the American Academy of Neurology and the American Headache Society. Neurology. 2012 Apr 24;78(17):1337-45. doi: 10.1212/WNL.0b013e3182535d20. Evidence-based guideline update: NSAIDs and other complementary treatments for episodic migraine prevention in adults: report of the Quality Standards Subcommittee of the American Academy of Neurology and the American Headache Society. Neurology. 2012 Apr 24;78(17):1346-53. doi: 10.1212/WNL.0b013e3182535d0c.